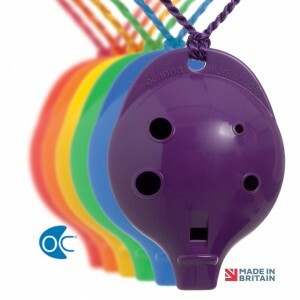 Primary-age children like the fact that the Ocarina is chunky, tactile and pleasant to hold, available in six bright rainbow colours and worn on a matching string to signify ownership: this keeps the Ocarina safe and ready to play all day. Secondary-age children and adults find that the Oc unlocks latent musicianship. The Ocarina gives everyone a chance to make music to an appropriate standard, whether just a handful of notes or hundreds of tunes. Try it yourself – you will be amazed at what is possible with this precision-designed 21st century instrument.